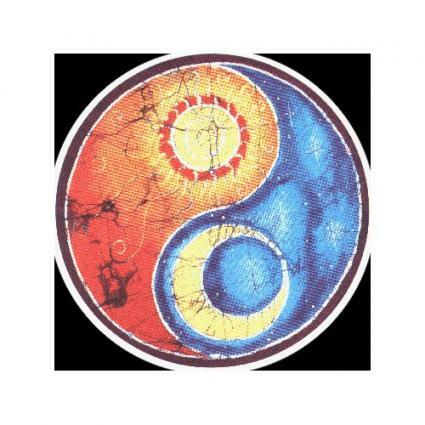 Ying yang suns are beautiful works of art that can enhance your home decor as well as remind you of the importance of maintaining balance in your life. A unique take on the traditional yin yang symbol, suns are not quite so easy to find. However, diligent searching of the Internet and art boutiques occasionally turns up a gem from this genre. The interplay of yin and yang energy is the founding principle of the art of feng shui. Yin energy is dark and feminine. It represents cold, introspective, passive and even subconscious energy. On the other hand, yang energy is the perfect complement to yin. It's bright and masculine, warm and extroverted. Together, these two distinct energies balance the universe and bring harmony. They are necessary in equal amounts to help all living things prosper and grow. When there is a disruption in the balance, the flow of energy, also known as chi, stagnates. This can lead to unfavorable living conditions that can affect various areas of your life, depending upon where that stagnation occurs. A single symbol encapsulates the principle of of yin and yang, sometimes referred to as ying and yang, beautifully. The ying yang is a circle perfectly divided between these complimentary energies. Each half of the symbol contains a drop of the opposite half's energy to show that the two are inseparable. Although the basic ying yang symbol is a study in black and white, artists have taken great license with this design and created some truly imaginative works of art with it. Ying yang suns are one such theme used, but there are many other designs to enjoy. Crafters and artisans ofen incorporate dragons, tigers and koi into standard yin yangs with beautiful results. The sun provides a great deal of natural inspiration for an artistic rendering of the ying yang. The sun's heat, light and boldly positive energy offer a perfect way to express the concept of yang energy, and this is incorporated into ying yang designs in different ways. 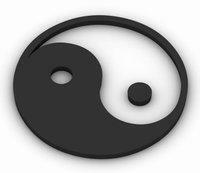 A creative sun and moon ying yang symbol is very common and easy to find. This design places the sun in the yang half of the symbol and the moon in the yin half. The sun contains a small moon and, likewise, the moon half contains a miniature sun. DeviantArt.com displays a great photoshop image that's also available for purchase. Allposters.com offers a fantasy piece that captures the sun and moon, as well as heaven and earth. A full sun design ying yang doesn't include the moon imagery. Instead, this type of design uses a fairly basic yin yang as the center of the piece and encircles it with the rays of the sun. You can find these designs in a variety of colors and styles. If your feng shui consultant advises you that your environment lacks yang energy, adding a ying yang sun in a strategic location might be a way to increase it. DeviantArt.com also features an artistic rendering in black and white. Lukanovich.com features a primitive rendering in oils. CafePress.com di-splays another interesting tribal style design. Devall.com offers an inspiring double layer sculpture. You'll have to do a bit of searching to find a sun-inspired ying yang if you want to add one to your home, but it will be well worth it for the beauty and inspiration the design has to offer.